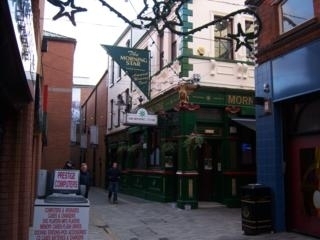 Halfway down a narrow lane,hidden in the entryway between Ann Street and High Street in the centre of Belfast, the Morning Star, one of the citys most historic pubs, first built as a coaching stop for the Belfast to Dublin post. Theres a traditional bar downstairs and a cozy velvet and wood-panel restaurant upstairs. Also notable is the steak menu; youd be hard-pressed to find a larger assortment of aged beef cuts. Sizzling steaks arrive at the table on red-hot cast-iron skillets and are served with a flourish by the friendly staff. lies what is most possibly the world's best eating and drinking house. God himself has not yet given us the word to describe the quality that will amaze punters while visiting this piece of Belfast history. The staff are amazing and the locals are even better. With lunchtime carvery from £5 per plate there's no better value in Belfast. Have you got Google Earth on your computer? If so, then download the Google Earth view of The Morning Star. Is this the wrong position for The Morning Star? If you think so, then modify its position. Click / Tap the button above to get directions from where you are to The Morning Star. Great night here last week with a great fillet steak, whiskey and irish coffees to finish it off. A proper Belfast Bar with great food and service. Highly recommend. In here recently and got a had a great time, some live music, craft beers and a few halfins (whiskeys). Also had a burger here too the week after. All great and would highly recommend. Staff were lovely too. I have been a frequent visitor to the Morning Star over the years and it is a great bar atmosphere wise but in my opinion the food has become very overpriced and is not as good as it once was. I went this week and thought that £4.50 for a starter of two small pieces of ciabbata, £9.00 for a bowl of stew and £9.00 for a small chicken breast on a very small dollap of champ was not value for money. I also thought the food was overcooked, bland and very chewy. I brought visitors from England recently and they winced at the prices, the stew especially. The Morning Star is a popular place but if you start taking customers, prices and standards for granted they often slip and people will go elsewhere. I really do think they need to review their prices and up the quality again if they want to keep existing customers and attract new ones. This is one of the best bars in Belfast. The bar staff are excellent- friendly and efficent. Food is v good. Also the customers are friendly-Too be honest I would struggle to fault it. THe morning star is by far one of the best bars in Belfast. Food is top notch and staff are friendly and professional. Will be back- also great for sports. Was there a few weeks ago and had a ball, the buffet lunch was outstanding value and the staff were very friendly, The bar staff are as good as any in belfast and always try to make you feel welcome. Great food, at good prices, clean, friendly bar. And the steak is great, must taste it! nice little waitress great food at good prices! Excellent food love the buffet luch. Good prices would not pass it when in Belfast. best steak ive ever had! Great food, at good prices for belfast!! great crowd ill def be back in for more! the morning star has poor food, an the bar man r too slow i wouldnt evan call them bar men, but the waitress they were nice an friendly, worest pub ever, ill b telling my mates not too eat here. I have been going here for over 20 years, I defy anyone to get better food at better prices anywhere in Belfast, seafood and steak superb, Guiness excellent. Brilliant atmosphere with fantastic food and drink. Lovely waitress called Ulga. Lovely pub. Lovely waitress called Caroline! Anyone know her, tell her Keith was asking about her! !